Lawns, golf courses, and maintained meadows are neither natural communities nor semi-natural communities . We'll call them not-so-natural communities. Sometimes called “cultural vegetation,” these areas are managed and maintained by human intervention. Rock Creek Park has several types of these non-natural vegetation communities. The National Park Service maintains about a dozen or more small areas as meadows for wildlife diversity. Many creatures, such as field mice and their predators, butterflies, pollinator insects, and grassland birds benefit from openings such as these. These open areas are maintained by occasional mowing. In the past, it’s possible that fires caused by lightning and Native Americans may have created infrequent prairie-like openings in what is now Rock Creek Park. Map tip: To find some of these managed meadows, go to the interactive map of Rock Creek Park and search for "meadow." 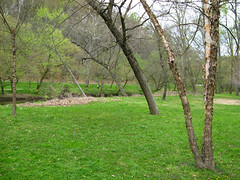 Picnic area along Rock Creek in spring. Photographer: Erin Lunsford Jones, courtesy of NatureServeRock Creek Park has several picnic areas near the creek. While the trees remain typical of floodplain communities, the understory is maintained as lawn by regular mowing. Map tip: Search for "picnic areas" on the interactive map of Rock Creek Park and select results under Recreational Facilities. Another category of not-so- natural communities is landscaped areas, such as the Rock Creek Golf Course and any other regularly mowed areas, and plantings around buildings. Map tip: To find landscaped areas (developed, open space) at Rock Creek Park, go to the interactive map of Rock Creek Park and search for "open space." Wetland swales dominated by cattails were created to slow down and filter urban runoff before it enters streams. These human-made wetlands occur northeast of the core park, in the Fort Circle Parks area.